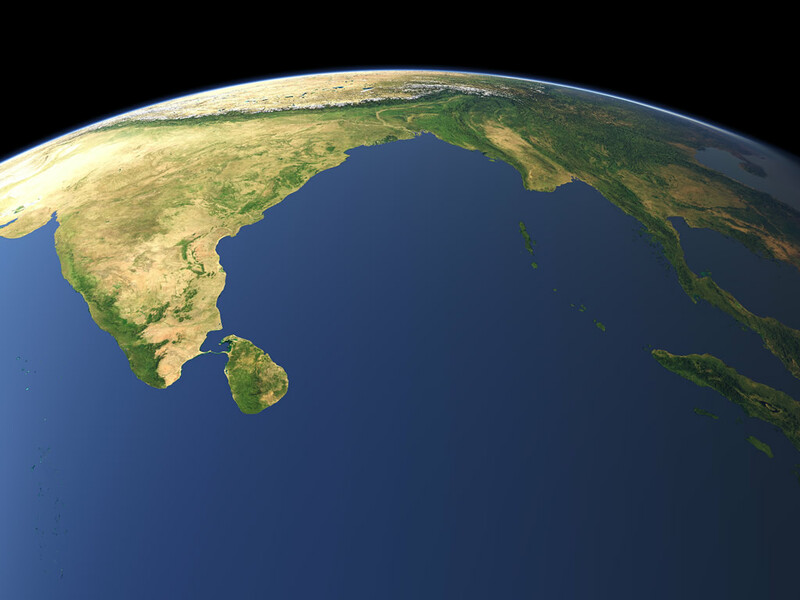 Over 400 million people in the Bay of Bengal area are dependent on coastal and marine resources for their food, livelihood and security. Rapid population growth, high dependence on resources and increased land use has resulted in over exploitation of fishstocks and habitat degradation, and has led to considerable uncertainty whether the ecosystem will be able to support the livelihoods of the coastal populations in the future. Despite the large number of international, regional and sub-regional bodies and programmes operating in the Bay, none have a clear mandate, geographical scope and/or capacity to support a regional initiative that would effectively address the issues confronting the coastal communities of the BOB. Furthermore, the current existence of many ineffective policies, strategies and legal measures at the National level would likely impede the development of any regional arrangements. Other major constraints include weak institutional capacity at national levels, insufficient budgetary commitments, and lack of community stakeholder consultation and empowerment. 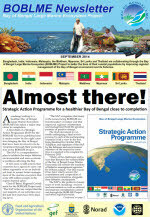 Maldives, India, Sri Lanka, Bangladesh, Myanmar, Thailand, Indonesia and Malaysia, have declared their willingness to work together through the Bay of Bengal Large Marine Ecosystem (BOBLME) Project and lay the foundations for a coordinated programme of action designed to improve the lives of the coastal populations through improved regional management of the Bay of Bengal environment and its fisheries. 1.1. 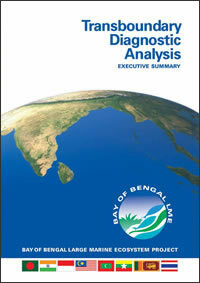 Transboundary Diagnostic Analysis preparation –building on the BOBLME’s existing draft Framework Transboundary Diagnostic Analysis and complete the Programme’s TDA. 1.2. BOBLME institutional arrangements –identifying and establishing agreed to permanent institutional arrangements ensuring the long-term management of the BOBLME. 1.4. Strategic Action Programme formulation and adoption –a process for the formulation of an agreed Strategic Action Programme (SAP). 2.4. 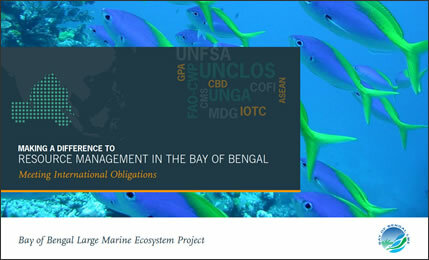 Collaborative critical habitat management - promoting multi-national approaches to manage and address issues affecting transboundary coastal/marine ecosystems within the broader BOBLME region. 3.3. Improved regional collaboration - establishing effective partnerships with other regional and global environmental assessment and monitoring programmes. 4.1. Establishment of an effective ecosystem indicator framework Agreed ecosystem indicator framework designed to measure progress toward sustaining BOBLME health. 5.1. Establishment of the regional coordination unit (RCU) - establishing a RCU for coordination of BOBLME supported activities leading to the finalization of the Strategic Action Programme. 5.2. Monitoring and evaluation system - establishing a cost-effective monitoring and evaluation system in conformity with existing FAO and World Bank policies and procedures. 5.3. Project information dissemination system - disseminating information to regional and global stakeholders relevant to the BOBLME and the BOBLME Programme. The Food and Agriculture Organization of the United Nations leads international efforts to defeat hunger. Serving both developed and developing countries, FAO acts as a neutral forum where all nations meet as equals to negotiate agreements and debate policy. FAO is also a source of knowledge and information. It helps developing countries and countries in transition modernize and improve agriculture, forestry and fisheries practices and ensure good nutrition for all. Since its founding in 1945, FAO has focused special attention on developing rural areas, home to 70 percent of the world's poor and hungry people. The FAO Regional Office for Asia and the Pacific has been in Bangkok and working in the Bay of Bengal area for over 50 years. It has an impressive track record of work in agriculture, forestry and fisheries in support of food security, rural poverty alleviation, and institutional and human capacity building; and a proven ability to execute regional and national field projects in a wide range of disciplines. 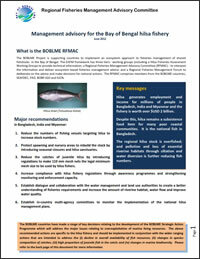 The BOBLME Project will also involve FAO working in areas of fisheries and resource management that it has championed and gained considerable world-wide recognition. The BOBLME Project is funded principally by the Global Environmental Facility (GEF), Norway, the Swedish International Development Cooperation Agency, FAO, participating Governments and the National Oceanic and Atmosphere Administration (NOAA) with a total estimated budget of $USD 31 million over five years.